GOODGOD Small Club ~ GOODGOD BIRTHDAY NIGHTS: SMASH HITS! GOODGOD BIRTHDAY NIGHTS: SMASH HITS! This Labour Day long weekend, we celebrate three amazing years of all-night parties, daring live music, and everything in between! Come revel in the memories and help celebrate our shared history! Get the scoop on the full lineup here, and don’t forget that we are holding TWO parties to celebrate! Check out Sunday’s Birthday Nights: Goodgod All-Stars! 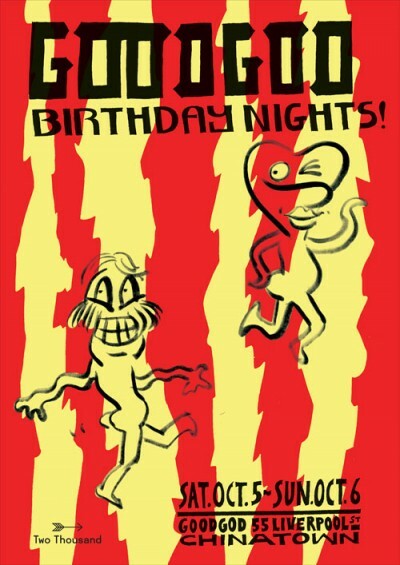 Goodgod Birthday Nights is presented by TwoThousand!